Archaeologists have discovered the rare remains of a dinosaur that walked on this planet 72 million years ago! They have uncovered the tail which is a whopping five metres long. Experts from the National Institute for Anthropology and History think it was a hadrosaur, or a duck-billed dinosaur. 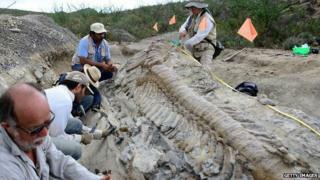 The tail was the first ever found in Mexico and is unusually well preserved. It will be transferred to the city of General Cepeda for further investigation. Find out more about how to spot a fossil.